In North Carolina, where I live, blueberries ripen between June and August. But I can buy blueberries throughout the year. That’s because most people only eat a few kinds of food, so farmers around the world grow the same crops, meeting the demand of consumers that live in another hemisphere. As Rob Dunn points out in his new book, that practice poses some significant risks. This focus on a remarkably small number of plant species means that there is very little genetic diversity among the crops that are most important for feeding people around the world. If an unexpected crop pest – such as an insect, fungus or virus – arrives on the scene, people will starve. It’s happened before. Dunn recounts the histories of outbreaks from the 19th century’s devastating Irish potato famine (caused by the pathogen Phytophthora infestans) to the rise of an insect pest that plagued cassava crops across Africa in the 1970s and 1980s. The cassava crisis – and it was a crisis – was averted only by the intervention of a relatively small number of biologists who were able to find a species of wasp that effectively decimated the mealybug population that was destroying crops. Dunn argues convincingly that it’s not a matter of whether another crisis is forthcoming, but when it will happen. And that risk is exacerbated by global climate change. Further, Dunn points out that surprisingly little has been done to address the problem. If this sounds like the book is all doom and gloom, it isn’t. It is both fascinating and scary, but it also outlines what can be done to ensure that we are better prepared to face the food challenges of the future. 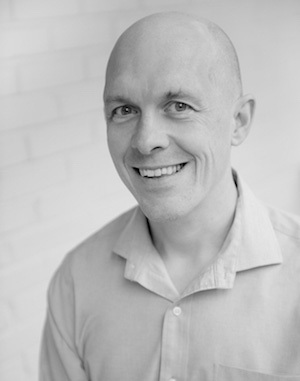 We recently had a chance to talk to Dunn about the book and the challenges it addresses. Science Communication Breakdown: The book looks at the history of crops and crises ranging from chocolate and coffee to rice and wheat. Why did you focus on these crops? Were there any stories of crop crises that you left out? Rob Dunn: I wanted to tell stories that evoked different aspects of our race to escape the pests and pathogens. There are many more stories I could have told. Grapes, for example, and their collapse, would be a classic one. Avocados. Citrus. I could have spent more time on coffee. I chose stories that I thought evoked general aspects of the broader story. The banana, for instance, isn’t the most important crop in the world in terms of sustenance, but its story is very emblematic of the way we often approach pests and pathogens. We planted a monoculture. A pathogen found it. The monoculture collapsed. We planted a different monoculture. There were many crops I would have liked to have written about but where the story of their pests and pathogens is not yet entirely clear, or where the crops might relate to readers in some region (or specialists) but not necessarily to a general reader. For instance, the story of dates is fascinating, but many of the details of date biology are not terribly clear and dates resonate (I thought when writing) less with the average reader than might chocolate. SCB: If there is no significant change in how we farm, or in how we study agriculture and the various species related to agriculture, what does the worst-case scenario look like to you? 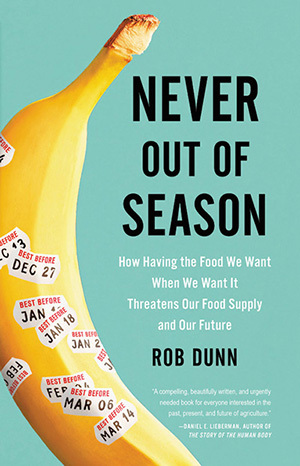 Dunn: For our average daily bite of food I think the status quo is that a smaller and smaller number of big companies engage, on our behalves, in an ever faster race with pests and pathogens. Sometimes those companies will fail to be able to keep up, and when that happens the consequences will be global. But I think the more worrisome aspect of the future of agriculture is not this industrial race (a race that I suspect nature will always, in the end, win), but instead what happens to the many regions at the margins of where the big, industrial crops can grow. The Middle East. North Africa. In the future, parts of the Andes (with climate change). I think that the more worrisome scenario is that we fail to keep up with pests and pathogens or climate change in those regions and it leads to global instability. As I argue in the book, I think it is just such a scenario that is already partially at play in Syria. The worst-case scenario, in other words, in the next 10 years is regional agricultural collapse, combined with mass movement to cities, government instability and emigration. SCB: While the warning of potential crop devastation is scary, the book offers hope as well. You outline a sort of “grand challenge” for the research community, regarding the need to understand crop pests, the natural enemies of those pests, and the mutualists that support crops. Can you lay that out for me? Dunn: We have never completely studied any patch of forest or grassland on the planet. We don’t even have a very good guess, for example, how many species live in Manhattan. We need to understand the life around us if we are to manage it. I think one starting point would be a grand survey of the species in agricultural fields around the world, the species that eat our crops and those that help them. This is an achievable goal and yet we have not achieved it yet (perhaps surprisingly) even for a single crop. Yet each time a crop fails we look to these fields around the world for new varieties, new genes, new enemies of pests, new mutualists of our crops. We either get lucky in our frantic searches or we fail to. But imagine if we had a full list of the species in our crop fields in different regions and imagine too that we knew their biology. It would be a huge jump ahead. Right now, we are far from such an effort. There is not even a single comprehensive list of the pests and pathogens of crops and where they live, much less the same sort of data for the mutualists of crops. What are the fungi, for example, on which cacao most depends and where do they live? How diverse are they? Where do their wild relatives live? We don’t know, but we could. The beauty about such an effort is also that it could involve not just people in our city or state, but people around the world, millions of people, or billions, who could help us to document the life from which we flee or on which we depend. We know how to do such a thing. We just need the will and funds to do it. SCB: In the book, you say this grand challenge would be “one of the most ambitious projects ever undertaken in biology,” and that “history will judge us for our efforts (or lack thereof).” How far along are we in addressing that grand challenge? Are any nations or organizations leading the charge there? Dunn: Right now, we don’t know what pollinates cacao (chocolate) in the wild. We have little understanding of the wild pollinators of potatoes in the Andes. Although one wasp saved cassava (by laying its eggs in and destroying the mealybug that was killing cassava) we don’t know the relatives of that wasp, where it evolved, or how many other similar species might exist (and what great talents they might have). Squash bees pollinate squash plants, but we don’t have good data on where squash bees live. Some squash beetles vector pathogens to squash (some don’t) but we don’t really know why or where. And the more diverse the region in which a crop grows, whether in terms of crop varieties or wild biodiversity, the less we tend to know. SCB: Grand challenges can seem, well, grand. In other words, they can seem so daunting that it’s hard to know where to begin. Are there specific questions or challenges that you think could – or should – be priorities for the research community? We are just getting started, but we think we can do the job well for squash, we have part of the team we need (another part of the team will be thousands of people in the public, growing squash). From squash, we might move to chilies. From chilies to cassava. From cassava to cacao (we are already working with teens in Mexico and Colombia on cacao). It is possible, especially if we approach the effort with a mix of wonder (at the grandeur of the biodiversity on which we depend) and a sense that what we are doing matters both now and to future generations. SCB: What, if anything, can people who aren’t farmers or scientists do? For example, what actions could I take to help address the overarching problems discussed in the book? Dunn: There are simple things. If you can afford it, eat whole foods (the things that still look like the plants, fruits and vegetables). Eat local whole foods. Eat local whole foods from unusual varieties. Each of these things helps to support the farmers who are ultimately the ones that play one of the most important roles in sustaining or failing to sustain the varieties (and wild species) that we need when things go wrong. By the same token, enjoy unusual varieties of crops when you can. Help create a market for them. The quest for ever hotter peppers is ridiculous, and yet it has helped sustain a rebirth in interest in unusual varieties of peppers. These sorts of efforts aren’t a panacea, but they help. Grow a garden. Help us to study the pests, pathogens and mutualists in that garden. Get to know which crops are native to your region or are particularly diverse there. Pay special attention to those crops. Okra is very diverse in North Carolina, but much of that diversity is not documented. If you have stories of varieties you love, write them down, share them. Plant the okra your grandma planted, but also the one her cousin grew. Savor them. Share them. Engage your government. Vote. Vote for funding for science. Vote for candidates who support agriculture not only where you live but also in those places where many crops are native (Mexico, Syria, Turkey, etc.). Your well-being depends as much on what happens agriculturally in Syria as it does on what happens in Kinston, N.C.
SCB: One of the issues that the book doesn’t address is the environmental impact of transporting food from the farm to the table; for example, the impact of shipping fruit from New Zealand to the U.S. Why did you decide to leave that out? Dunn: I had to decide which stories to focus on. The book isn’t a manifesto. It is a consideration of an aspect of agriculture that I see every day at a land-grant institution, but that I think even people who care about agriculture are relatively unaware of. Also, I think I have some clarity about the most likely scenarios for the evolution and spread of agricultural pests and pathogens. They obey ecology’s rules (the rules I’ve spent my career studying). The sustainability of global shipping and the strings that control it obey the rules of global liberalist economics. It is a different book, an important part of the story and yet another book. Also, to be honest, I’m just personally fascinated by the interactions among species. I’ve written about life in the deep ocean, human bodies, hearts and crops, but when I do that I’m always really writing about the interactions among species, how we study those interactions and what they mean for our daily lives. SCB: I know that you were already a vegetarian, but did your research for this book change the way you shop for food or what you eat? Dunn: It encouraged me to get back into my garden. It encouraged me to connect with people at the university running the agroecology farm. It was one more kick in the pants to buy what I can locally and from farmers I know. It also made me more grateful. Every bite of food is a kind of lucky miracle dependent on many people, pollinators, fungi and the succession evasion of pathogens. It is easy to take that for granted. Writing the book reminded me not to. Many people have died trying to ensure we all eat. That is humbling. Right now people are dying in Syria trying to protect farms there. Writing about Syria really affected me. To realize that we break bread which was invented in Syria or Iraq, drink beer that was invented in the same region, sit at tables (which were also first built in Syria and Iraq), eat dates, and otherwise live a life with many features framed by those first farmers and connected to their modern descendants in the same region, that moved me, moves me. Right now we are closing our doors to the very people whose food we farm. That doesn’t seem like it relates to the book, but it does. SCB: As a researcher, do you have any ongoing or forthcoming projects that address any of the challenges discussed in the book? Dunn: As I mentioned, we have big projects to study the pests, pathogens and pollinators of squash, with the public. Similar projects for chilies. An ongoing project on cabbage, kale and their relatives and the tiny butterfly that destroys them (the Pieris Project). We are studying how to bring diversity back into the microbes used in bread and beer making (the Sourdough Project, and the wasp project, respectively). Also, we have recommitted to studying the natural history of crops in other ways. We are working on a project in which teens will help to document the pollinators of cacao. We are also running a project in which we are trying to find out what beneficial microbes can be found in seed banks (no one has ever checked). We are studying whether crops as they have been moved around the world have left their mutualists behind. Finally, we have a small fund to support graduate students who study the natural history of agricultural systems. SCB: Last question. Writers almost always have to leave one good story on the cutting room floor – that one great story that just didn’t quite fit in to the rest of the book. What’s one story that you hated to cut from this one? Dunn: Oh, I wrote a 10,000 word section on how a single, strange bug destroyed wine grapes, how wild grape root stocks saved wine grapes, and the ways in which that story influenced global politics and related to the story of how a Croatian grape made it to Italy, then to Austria, then to California and became Zinfandel. Rather than embodying one part of the book, it embodied too many aspects of the book all at once. It was, in a way, too sweet. I loved it. I cut it. Note: I posted an interview with Dunn in 2012 on the subject of “Popular Science Writing by a Scientist.” Check it out. Very interesting! And scary, too. Had to share this, hopefully some FB friends will be inspired to diversify their diet (a good idea anyway, you gut flora will thank you) and possibly influence their politicians to provide funding for research. Thank you!